"He aimed at the my leg. Pow! And then took off running," said the victim, William Weldon. CONCORD, N.C. — A military veteran says he's lucky to be alive after he was shot in the leg Sunday evening at the AMC movie theater at the Concord Mills mall. "He aimed at the my leg. Pow! And then took off running," said the victim William Weldon in a video posted to his Facebook page from the hospital. Officers responded to the theater around 6 p.m. Sunday after a report of shots fired. Weldon says he went to the theater to see the move Us with his mom. He said he purchased reserved seating and when they walked into the theater a man and a woman were sitting in his seats. "I showed him the receipt, and I flashed the light on it," Weldon said. "And he was like oh, ok and then he sat back down." Weldon says he didn't say anything further. He said there was never an argument or an altercation. "The girl that he was with, was like, 'come on. Let's just go. These are his seats. Let's just go.' So she stood up and grabbed him by the wrist," Weldon explained. The two got up from the seats and he started to walk off. Weldon said the man reached inside of his pants, pulled out a gun and shot him. "Where he shot me from, he could have reached out and touched me. He could have touched me. That's how close he was. He literally was in my face, and aimed down. It was like he aimed for my leg," Weldon said. The bullet went through one side of his leg and out the other side. Weldon said at first he didn't realize he was shot, but then he felt the pain. He tried to get to the emergency exit as he called 911. "I kind of limp and stumble outside," Weldon said. Emergency crews were near the scene, but police would not let anyone enter or exit the scene until they knew it was secure. "I seen a guy walk by and he worked at the theater. I seen he had on a belt. So I was like, give me your belt," Weldon said. The employee took off his belt and Weldon used it as a tourniquet. Someone who was inside the theater at the time of the shooting helped Weldon tighten the tourniquet until paramedics arrived. "They're going to catch you bro. They're going to catch you. You shot a veteran. They're going to catch you," Weldon said. "You know what I'm saying? They've got you on camera. You did all that just to prove a point." Concord Police said they arrested the person responsible for shooting Weldon Monday afternoon. 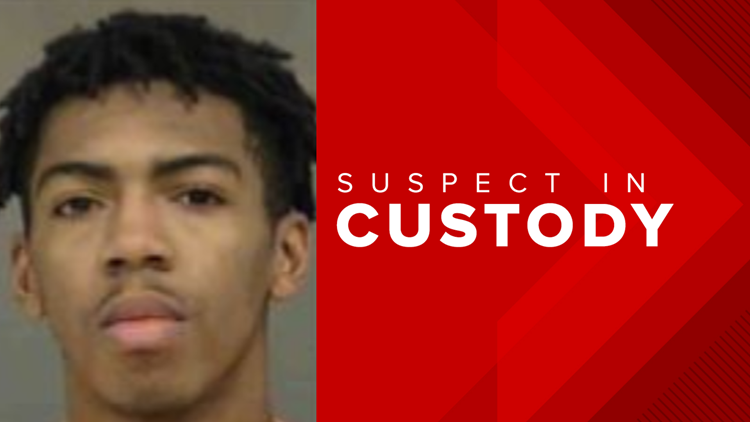 Bryant Gregory Eaves Jr., 18, was taken into custody at his home in Indian Land, South Carolina. Eaves was charged with one count of assault with a deadly weapon inflicting serious injury with intent to kill. He agreed to be extradited back to Concord. Weldon said his mom was so close to the suspect when he fired the shot that she felt the heat from the gun. "She got a burn mark on her arm. Because when he pulled the trigger and it blast, she felt the heat," Weldon said. His mom was not seriously injured. Weldon was treated and released from the hospital. "I'm in a lot of pain. Getting shot isn't fun. And I was supposed to be on orders in the morning," Weldon said before he was released. The mall was closed during the investigation. People at the theater said incidents like Sunday's shooting have made them cautious about going to the mall or the movies. "It just sounded like popping noises, and everybody started running," said Brach Walker, who had just left a movie at the time of the shooting. "And so I started running so I didn't have to be, you know, in the chaotic moment." Jonathan Winchell said he saw police tape and a trail of blood by a ticket stub. "I can't lie, there have been a few times where I've been to a movie where I get kind of paranoid because people wander in the middle or someone brings in a big bag," Winchell said. Anyone with information is asked to contact CPD at 704-920-5000.